An 8 week stand up comedy course on writing and performing stand up, culminating in a live showcase performance in front of a friendly audience at our comedy club. No previous experience needed, complete beginners are welcome. No previous experience in stand up, writing or comedy are needed to do this course. Every Tuesday for 8 weeks from Tuesday 14th May 2019, plus show on Thursday 4th July 2019. SOLD OUT. Price: £210. Either payable all at once or with an initial payment of £100 followed by the remaining £110 at the start of the course. Venue: The Nursery Training Centre, 6th Floor, Capital House, 42 Weston Street, London Bridge, SE1 3QD. Venue: KCBC, Vernon Square, King’s Cross, London WC1X 9EP. Every Wednesday for 8 weeks from Wednesday 5th June 2019, plus show on Friday 26th July 2019. SOLD OUT. Venue: Theatre Delicatessen, 1st Floor, Next to 2 Finsbury Avenue (off Whitecross Place), London, EC2M 2PP. Tube: Liverpool Street or Moorgate. Nick Hall is a stand-up, improviser and writer. He has written and performed for BBC2, BBC3, and BBC Radio 4. Nick has taken six solo shows to the Edinburgh Fringe Festival, as well as performing at the Brighton Fringe, Latitude Festival, Soho Theatre, Princes Trust, and Bloomsbury Theatre. Nick started his comedy career by beating the Gong at The Comedy Store, beating the Blackout at Up the Creek, and winning the New Act Night at the Comedy Café. He has now performed over 500 gigs across the UK and Europe. Nick comperes a variety of live events, including cult movie night Hot Tub Cinema and hit football show Comedy Commentary. 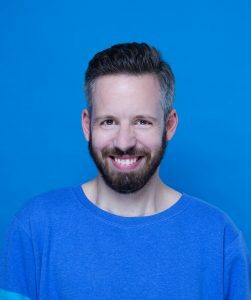 He also performs with The Committee, one of London’s hottest improvised comedy groups, and has appeared on Sky News, The Times Red Box podcast and written articles for The Independent. Don’t think it twice, do it! After this course you will learn how to structure ideas, become more creative and a better communicator. This has been an amazing course and we learnt tons from it. Our showcase was a great success! Good job, guys! Thanks for pushing us to be the best we can! The best thing was in fact just how much fun the course was. The teacher was great, my fellow students were great and this all made the end of course performance a blast! Not only a brilliant teacher but also a veteran comedian and a current performer himself, so he knows exactly what you’re going through. Classes are always a lot of fun & entertaining. The eight week course with Hoopla for Stand Up comedy was great, full of fun, games and laughter like being with old friends but they were new friends. Don’t, whatever you do, hesitate to sign up for the course. I enjoyed every moment of it and gained a lot of confidence thanks to the support and feedback that I received from my hilarious friends and talented teacher. The course is fantastically interesting and incredibly fun. A brilliant teacher - very patient and the classes are well structured. Not only did I complete the course but I also did a 5min comedy set at the end of the course, which I absolutely loved, I even invited a bunch of mates, which I never thought I was going to do! The course was facilitated by an experienced stand-up in a very relaxed, fun, encouraging way. Our stand up comedy course is about giving you the skills to produce great work over the long-term. All students will leave equipped with the techniques and philosophies required to be more creative. We aim to help you express what is uniquely funny about you. We will instil in you a passion for comedy, and a feeling that you are enlarged by the whole experience. Suitable for all, from complete beginners to people who’ve already done some gigs. We adapt to each person so everyone is welcome. We will provide a safe environment for our students to perform a short set every week. We don’t think you can learn comedy from a book: you need to learn by doing it and finding out what is uniquely funny about you. You will learn how to write hilarious material, and also how to perform it with charisma and skill. Furthermore, you will be given an insider’s view of the circuit to avoid the common pitfalls of beginners. Our coach is a working professional stand-up. They have been there and done it, so they know all about the journey from beginner to professional. They have unique insight into what it takes, and what has helped them make the jump. No previous experience needed, complete beginners are welcome. No previous experience in stand up, writing or comedy is needed to do this course. The course will focus on the laughter of recognition, and the importance of being relatable with your material. Through truth you’ll find the funny, specifically your own truth. We will work on the students confessing to their own minutiae as that is what audiences connect most to. Through teaching and group discussion we will look at the importance of character, and stand-ups with a distinctive “attitude” or “point of view” i.e. the character a stand-up uses onstage. Alongside character, we will look at the importance of exaggeration in comedy: through exaggeration comes truth. The aim of this part of the course is to help the students identify the funniest part of their personality and turn it up to 11. Through this process the students will build their clown, their own distinctive comic character on the stage. We’ll also look at the vital importance of conviction in both the writing and performance of material. We’ll look at building stories. How to take the cornel of a story and build it into a longer “bit”: full of jokes and amusing imagery. We teach people that stories are made, not born, and we will focus on the craft of building routines. Including mic technique, psychological warm-up planning to help prevent stage-fright, the ordering and linking of material (segues), easy errors to avoid. Don’t think it twice, do it! After this course you will learn how to structure ideas, become more creative and a better communicator. I enjoyed every moment of it and gained a lot of confidence thanks to the support and feedback that I received from my hilarious friends and talented teacher. The eight week course with Hoopla for Stand Up comedy was great, full of fun, games and laughter like being with old friends but they were new friends. The teacher is a lovely guy, brilliant communicator , and professional comedian. Don’t, whatever you do, hesitate to sign up for the course. Not only a brilliant teacher but also a veteran comedian and a current performer himself, so he knows exactly what you’re going through, to help you overcome any sticking points ... From covering the exact formula on being confident all the way to speaking and holding the attention of an audience, this course leaves you with lots of different skills that help you outside of being a stand up too. The course was facilitated by an experienced stand-up himself in a very relaxed, fun, encouraging way. From covering the exact formula on being confident all the way to speaking and holding the attention of an audience, this course leaves you with lots of different skills that help you outside of being a stand up too.